The Colorado state flag has been in use for more than a century. 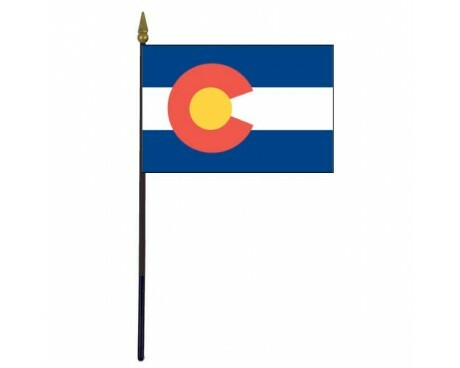 The flag has undergone more changed than the majority of state flags during that time, but the fundamental aspects of the design have remained reasonably consistent since the first of the Colorado state flags was approved for official use. Colorado state flags have a single horizontal stripe of white between two stripes of blue. The flag also has an emblem that consists of a golden disc with a red "C" wrapped around it. The red and blue sections of the flag must always be the same shade as the red and blue portions of the national flag. The flag's colors represent the state's geography. 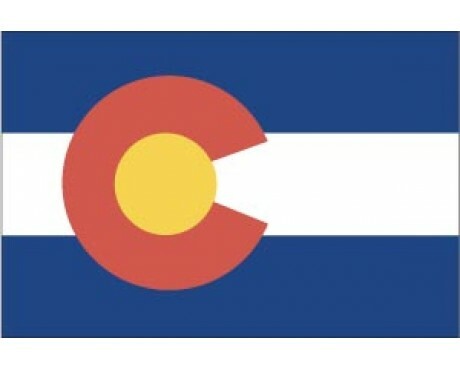 The blue stripes represent the sky over Colorado, while the golden disc represents the state's bright sunshine. The white stripe represents the snow that covers the mountains of Colorado, and the red section represents the state's stone and earth. The "C" on the flag reflects the state's name. 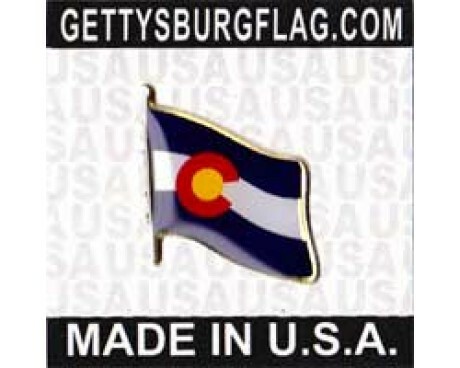 The Colorado state flag was adopted for official use by the Colorado General Assembly in 1911. The original design was provided by Andrew Carlisle Johnson, but the modern design is not the same as the original. The design that Johnson gave to the Colorado General Assembly was very vague, which lead to plenty of variety among early flags. His design included the same three stripes and emblem that can be found on the modern design, but he did not specify the precise shades or proportions for the flag. 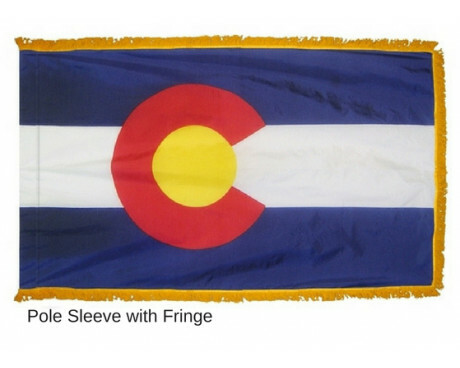 Colorado began to refine the design and standardize its flags in 1929, when the state government decided that the state flag should use the same shades of red and blue as the national flag. 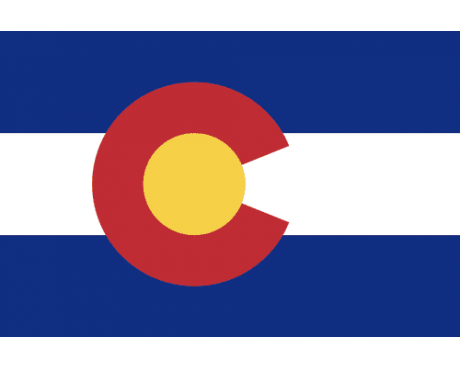 The government specified that they should always be the same rather than simply adopting the same shades, so the flag of Colorado will change if the national flag ever changes. The Colorado General Assembly eventually specified the size of the flag's emblem in 1964, which created the flag that has represented the state ever since. 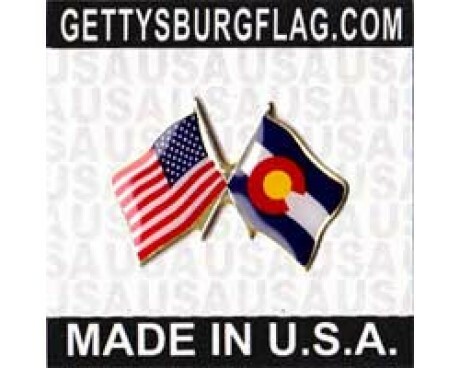 The flag of Colorado was adopted in 1911. Its official specifications were mysteriously altered with that the red C with the yellow center should be much smaller and placed immediately next to the flagstaff. In March 1964, the flag was made "legal". Colorado is known as the Centennial State, or the Columbine State. The red C can stand for either of these or for the state name. Colorado was ruled by Spain for many years and the name meaning "red" in Spanish. Partly in Spanish Territory, and partly in French Louisiana. In 1803, the French part passed to the U.S.A, and the Mexican in 1848. Colorado became a Territory in 1861, and was admitted to the Union on August 1, 1876.